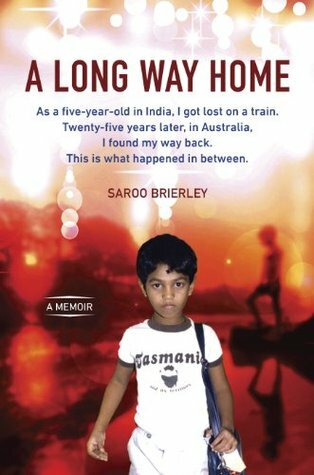 From Goodreads ~ At only five years old, Saroo Brierley got lost on a train in India. Unable to read or write or recall the name of his hometown or even his own last name, he survived alone for weeks on the rough streets of Calcutta before ultimately being transferred to an agency and adopted by a couple in Australia. I was on flight last year and started watching the movie Lion. I had 25 minutes left to watch when we landed. I figured I'd watch the rest on my return flight ... but they'd changed up the movies. Grrrr! Lion is based on this book so I thought I'd read it to see what I missed. Plus I assumed the movie didn't follow the book exactly (and it didn't). This is the true story of Saroo, who was one of four children living in poverty with a single mother in India. One night when he was five years old, he goes out with his older brother and ends up getting on a train alone that takes him to Calcutta. He wanders around for weeks before he is taken to an orphanage and is eventually adopted by a couple in Australia. Years later, he decides to find out what happened to his birth family and let them know that he is okay. This is a time when computers and the Internet weren't the swiftest and he eventually finds his old village by finding it on Google Earth. When he's about 30, he travels to India and is reunited with his birth family. I hadn't heard of Saroo's story when it happened. I first learned about it when I started watching the movie on the plane. I enjoyed the writing style of the book and found myself pulled into his story. I hadn't known how it would end (because I still have 25 minutes of the movie to watch) so was happy with the ending. I like that he is taking his experiences and helping others less fortunate. BTW, the picture on the cover is the day he arrived in Australia from India wearing the clothes his adopted parents had sent to him.